The industrial inspection article provides you with information about shop inspection, site inspection, and plant inspection. The articles are about different inspection field categories such as shop inspection, site inspection, and in-service inspection requirements. The articles present you applicable codes and standards. There will also be some links to other articles to complete your required information. Industrial Inspection System - Do you need to know different categories of inspection field such as Shop Inspection, Site inspection, Pre-shipment inspection and In-service inspection? If yes, this article has been written for you. This content explains each category with some examples and guides you to some other links on this website to give you even more information. Industrial Plant Inspection - If you need some information about industrial plant inspection, this article will be useful for you. This content explains in-service inspection requirement in the industrial plants. This article provides you applicable in-service inspection codes and standards for static equipment in an industrial plant. There will be some links to other articles to provide you with more detailed information. Inspection and Test Plan - The inspection and test plan is the term, which is widely used in the procurement and purchase of industrial equipment. It is applied to shop or vendor inspections and is a document that identifies the responsibility of the vendor, engineering company, third party inspection company and client regarding inspection "hold," "witness" and "Review" points. Shop Inspection - shop or vendor inspection covers inspection activities that are done by the second party or third party inspector. It is applied in manufacturing process of industrial equipment such as pressure vessels, pumps, compressors, valves, etc. Vendor Inspection - Vendor inspection is just a different name for shop inspection and is applied in the purchase and procurement of industrial equipment. This will describe the tasks of the vendor quality control personnel, the third party inspector, and the client responsibilities. This is very important subject in industrial inspection application. Industrial Quality Control - Do you need information about detailed tasks and responsibilities of the industrial equipment vendors and manufacturers? This article will show you, the detailed tasks of the quality control team of the manufacturers and their relationship and connection to the purchaser's inspector. Factory Acceptance Test - This article provides you with information about the factory acceptance test (FAT). This terminology is used for rotating, electrical and instrumental equipment that is under construction in manufacturing shops. Inspection scope - This article provides you information about the inspection scope of work. More stringent scopes of work will cause higher inspection costs and higher assurance for quality products, while less stringent scopes will cause lower costs and higher risks of producing non-conforming products. So you need to optimize your inspection level. Industrial Test Systems - This article provides you information about industrial inspections and test systems. This content explains the required test in each inspection field such as shop inspection, pre-shipment inspection, site inspection and in-service inspection. The test is some part of an inspection process. Explaining -the required tests for each equipment type is not possible in a single article. This article only guides you to accessing more information through the other articles on this website or by the introduction of the codes and standards. Industrial Test Calibration - This article provides you basic information about industrial test calibration. Measuring, inspection and testing equipment calibration is mandated by most construction and in-service codes. The manufacturer's quality control system needs to define a process for the calibration of measuring and testing equipment to ensure the reading values are correct and accurate. Material Inspection Receiving Report - This article provides you with information about material inspection receiving reports which are very important in the industrial inspection system. This report applies in the shop and site inspection and controls all incoming material to shop and site for construction. It is one of the more important inspection subjects in the industrial inspection system. Dye Penetration Inspection - This article provides you with the example dye penetrant inspection procedure. Magnetic Particle Inspection - This content provides you with a draft MP test procedure. Yon need modify this procedure based your project specifications. Radiographic Testing - This content provides you with an RT procedure. It is the draft and must be changed to meet your requirements. 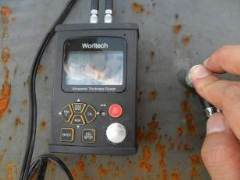 Ultrasonic Testing - This article gives you a sample ultrasonic testing procedure. This is a draft procedure and needs to be modified based user requirements. Annealing Heat Treatment - This article provides information about annealing process, temperature, holding time, heating rate and cooling rate and mechanical property of metal after annealing. Stainless Steel Cladding - This article simply provides basic information about stainless steel cladding over to carbon steel in the coorosive services. Metal Cold Working - This article provides information about metal cold working effect on ductility, strength, etc. Destructive Testing - The article provides basic information about tension test, bend test and impact test. Ferrous Materials - This articles explaines about these materials chemical compstions and mechanical and corrosion resistance properties. Weld Destructive Testing - This article provides information about destructive testing necessary for PQR, WPQ and production test purposes. Metal Hot Working - This articles explaines about metal hot working about recrystilization temperatuer and ductility and other mechanical propeerties characrtization. Plate Lamination Defect - This article describes plate lamination, and it causes in the plate material. The article also provides the acceptance criteria. Non-Ferrous Materials - This article provides information about non-ferrous materials properties and applications such as Aluminum, copper, and nickel. Normalizing Heat Treatment - This article describes the treatment by increasing the temperature to the certain temperature and cooling down in still air to improve machinability and ductility. Arithmetic Average Roughness Height refers to flange surface smoothness requirements. Nonconformity Report - This article provide with one example and indicates how an NCR report shall be addressed. Nodestructive Testing Map - The article explaines how the sketch is used to show the considered NDE method for different test location in the equipment. Engineering Specification for for Piping Stress Analysis - This article provides you with an example engineering specification for piping stress analysis that is used in plant construction projects. Engineering Specification For Piping Hanging And Support - This article provides you with sample piping hanging and support engineering specification. This content will be useful for inspectors involved in construction projects for industrial plants. Engineering Specification for Painting - This content provides you a sample for engineering specification for painting in the construction projects and covers both shop and site painting activities. Engineering Specification for Piping Design - This content is useful for inspection engineers that have the task of inspection of ASME B31.3 piping in construction projects. Engineering Specification for Steam Tracing - This content provides you with an example steam tracing specification that is used in construction projects. Engineering Specification for Hot Thermal Insulation - This content provides you with a sample hot thermal insulation specification. This is useful content for its design, application, and inspection. Engineering Specification for Cold Thermal Insulation - This content provides you with a sample cold thermal insulation specification. This content is useful for design, application, and inspection. Engineering Specification Piping Shop Fabrication Specification -This content with sample specification and can be applied to site inspection activities. Painting Specification - The content provides a sample painting specification with focus on inspection and testing requirements. Pipeline Wrapping and Coating Specification - The content highlights important inspection and testing at wrapping process. Pipe Three Layer Polyethlene Coating Specification - The content provides a sample specification and identifies all inspection and testing requirements. Pump Guides - Provides information about different types of pumps, quality, durability, prices and etc. For other information on the other Industrial Fields, you may review the HotVsNot Web Directory.